Available infrastructure as an essential part and condition for development of e-mobility is slowly gaining ground in Slovakia. On Wednesday the first fast-charging station for electric cars was launched. Since yesterday there are four public charging places in Slovakia. The new one, located at Slovnaft petrol station in Petržalka, is able to fully charge the eco-friendly vehicle in 20 minutes. Charging is free of charge until the end of 2012. 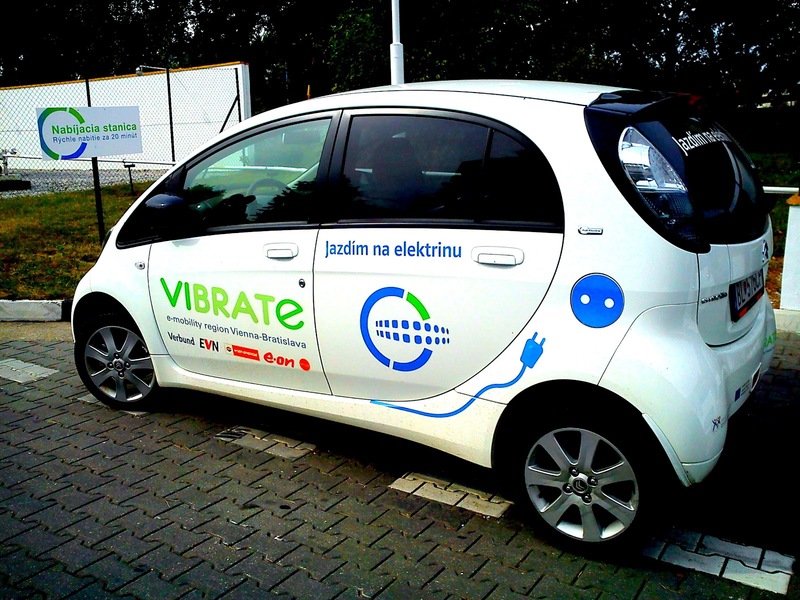 The new fast-charging point is a part of cross-border twin city project VIBRATe implemented in Bratislava – Vienna area. Consortium of Slovak and Austrian energy companies are aiming to create green highway between the two capitals and in the neighboring region. “Creating a network of charging stations and including electric cars into everyday operation, the VIBRATe project represents a complex and functional e-mobility model. Moreover, by building fast-charging stations we are contributing to greater comfort behind the steering wheel while offering further possibilities to effectively use emission-free vehicles in both city transport and regional transport,” says Andrej Devečka, member of the Board of Directors of Západoslovenská energetika (E.ON Group). Recently another fast-charging point was installed in Vienna and the partners plan to launch two more at the Austrian side by the end of the year. In April 2012 representatives of the power and electrical engineering industry established the Slovak Electric Vehicle Association (SEVA). They believe the potential for e-mobility in Slovakia is very high. They refer to very strong car production business in Slovakia and long-term cooperation between business involved and technology universities. The urban areas are the most perspective to push for alternative and innovative transport. “The city is supporting projects which have been neglected for 20 years,” said the representative of Bratislava municipality Petra Nagyová-Džerengová during launch of the fast-charging station. “Electric cars at least in the urban areas should be developed among the first ways of alternative transport,” she added. Developers of e-mobility in Slovakia are also looking for more partners, e.g. restaurants, cafés, petrol stations, hotels, parking houses or public institutions, that would make their private sockets available for charging electric cars. Apart from charging infrastructure there is still lack of clear rules of where, to what density and what types of charging stations for electric cars should be built. There is still an open question about the support for electromobility – via various systems of direct subsidies (such as in Sweden, Spain or the UK), system of tax breaks (Denmark), non-financial incentives, formation of rate of electricity consumption for the ecological purposes of transport, etc. In spring 2012 the Ministry of Economy confirmed it would like to use German National Electric Mobility Platform as an inspirational model for development in Slovakia and bilateral discussions with federal ministry have been initiated. Despite many challenges analysis carried out by the VIBRATE project team confirms that green interconnection of the region and e-mobility are no longer just drafts on a paper. Fifteen electric cars, having driven 56,000 km from January to June 2012, consumed 9 MWhs of electric energy and locally saved 5,600 kg of CO2 emissions. The average daily distance of 33-38 km shows possibilities of mainly urban usage. The testing champions in the longest distance driven were Wiener Hilfswerk organization and Slovak Ministry of Agriculture and Rural Development. The participants confirmed that the biggest disadvantage of e-mobility is still the high price of electric cars, yet they think positively of e-mobility. What they perceive as the greatest limit is the short running distance of electric cars, however the current running distance sufficiently covers their everyday needs of transport. “The respondents see usage of electric cars as a way of saving operational costs. They would accept charging time of up to one hour and they would pay 2 to 5 euro for charging,” Peter Ševce added.